(Nanowerk News) Nanoparticles are already widely used in everyday products such as cosmetics, textiles, dyes, and paints. It is quite possible that these minute fragments of matter may in future not only come to play a crucial role in medicine and pharmacology, but also in the food and biotechnology industries. The latest research currently being conducted in India has shown that nanoparticles can promote the growth of fungi and even assist plant growth. The Institute of Microbiology and Vinology at the Johannes Gutenberg University Mainz, Germany is also to become involved in this new field of research and will be collaborating with the Indian specialist Professor Dr Ajit Varma to investigate the effects of nanoparticles on microorganisms, particularly yeast. Yeast is an essential ingredient in the production of bread, beer, and wine. In the 1990s, Professor Varma discovered a fungus - Piriformospora indica - that grows in the Thar Desert in north-western India and significantly boosts the growth of various crop plants and medicinal herbs. Desert shrubs provide the natural habitat of the fungus. It can be readily cultivated, and the growth of many different plants is promoted when inoculated with the fungus. It colonizes the roots and sends out branched threadlike filaments, the mycelia, into the soil in order to find water and nutrients, which the host plant can then also benefit from. 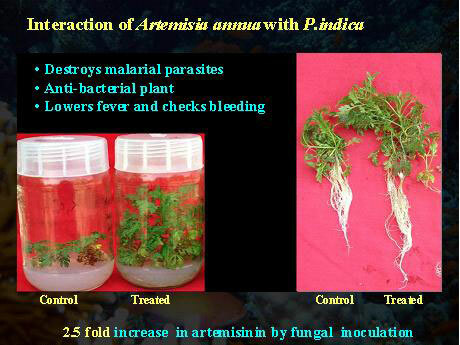 In the case of sweet wormwood (Artemisia annua), for example, the promotion of growth resulted in enhanced production of the active substance artemisinin by a factor of 2.5 in comparison with a control group that had not been inoculated with the fungus. Varma discovered a year ago purely by chance that the cultivation of P. indica is further facilitated in the presence of nanoparticles. When the fungus was brought into contact with titanium dioxide nanoparticles and used to inoculate broccoli seed, major improvement to the growth of the resultant plants was seen. "Our fungus interacts with the nanoparticles," explained Varma, who was in Mainz for three weeks thanks to sponsorship provided by the Alexander von Humboldt Foundation. "The nanoparticle stimulates the fungus and through it also promotes the growth of plants." Working in collaboration with Varma, Professor Dr Helmut König, head of the Institute of Microbiology and Vinology at Mainz University, will be able to use these new insights within research fields that are already well established in Mainz. "We will be investigating the effects of nanoparticles on various microorganisms." The two academics have known each other since the early 1990s when König gave a lecture on the biology of archaebacteria while on a research fellowship at Jawaharlal Nehru University in New Delhi, where Varma previously worked. "Because of their biotechnological importance for the food and biotechnology industries, we will be focusing in particular on yeast fungi," König announced. There will also be experimenting on bacteria and archaea to establish to what extent nanoparticles influence their proliferation, enzyme production, and survival. "We will obtain completely new insights into the cultivation of microorganisms if our experiments are successful. There is a massive potential here for industrial applications," König went on to state.